Hermes is a character originally from the Disney film Hercules. He is one of the Olympian gods. Hermes is a short male deity with a large head. He wears magenta-tinted glasses. 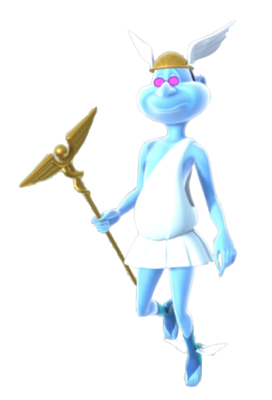 He has blue skin and wears a white toga. He wears a gold cap with wings and blue sandals with wings. He carries a caduceus staff. Hermes is a character in Hercules voiced by Paul Shaffer in the original film as well as the animated television series. He is inspired by the god from Greek mythology. This page was last edited on 20 March 2019, at 17:51.